John, your Core Name Numbers are 3, 5, and 7. John, your Expression number is 3, providing charisma, creativity, verbal skills, and a natural ability to inspire and motivate others. This energy draws people in. Others find you entertaining, a talent that could find expression professionally. The negative side of the 3 can be scattered and irresponsible, with trouble following through on projects or promises, so you may find it challenging to stay focused. Fortunately, this somewhat fickle and flighty number is teamed with your 7 Personality, pretty much its direct opposite. Serious, inquisitive, spiritual and philosophical, the studious 7 is the ideal partner to anchor the 3. You may (or may not) be aware of this, but chances are most people have difficulty "reading" you, at least initially. Your serious 7 Personality usually floats on the surface, obscuring the happy-go-lucky 3, but there are plenty of occasions when the sunny, superficial 3 appears. You likely vacillate between being introverted and extraverted, but because you have an additional social, gregarious 5 in your name (your Heart's Desire number) you will likely project the social, adventurous traits more often. All your core numbers are odd numbers, which suggests you tend to be more idealistic than practical, more project oriented than goal oriented, and more flexible and dynamic than stubborn and stable. Your 5 Heart's Desire suggests you need space, change, travel, and variety to be truly happy. Consequently, you do not enjoy routine activities such as working in the same office every day. You need adventure and are not afraid to take risks. However, you can also be impulsive, so think before you speak (or leap). You have a wide range of career options, including retail, marketing, academics, or entertainment (in the performing arts or music). Your thirst for knowledge and intellect would fit the academia, but the strict parameters of that environment could be challenging (and irritating for the independent 5). Your 7 Personality would fit well, but your happiness, ultimately, depends on satisfying your Heart's Desire — so the 5 should have the last word. NOTE: This chapter is followed by in-depth descriptions of each number individually, the Expression, Heart's Desire, and Personality. All four chapters are part of the free 8-page numerology reading included with our World Numerology App. Go on to read Ellen's core name numbers below; so similar, yet a very different result. Ellen, your Core Name Numbers are 3, 7, and 5. Ellen, particularly regarding talent and character, few number combinations are as promising and loaded with potential as the 3 Expression, 5 Personality, and 7 Heart's Desire. This is true even though, taken individually, these numbers do not tend to be wildly successful, financially or otherwise. Your potential is hidden in the balanced merging of their widely different but compatible attributes. Odd numbers tend to be idealistic, while even numbers are more pragmatic. In your personal makeup, you fall squarely into the first category. You have the dynamic energy of a 5 Personality, so you may have issues with restlessness and boredom. You may also be somewhat rebellious, especially during your childhood and teen years. Your 3 Expression adds the childlike enthusiasm and creativity of this upbeat, optimistic, but somewhat scattered number. To complement and supplement this combination, the 7 brings intellect, introspection, and an inquisitive nature. Both the extraverted, verbally gifted 3 and the introverted, scholarly, and rather serious 7 are part of your makeup. These conflicting traits may be confusing to others. One moment you might be outgoing and full of charisma, and the next seem withdrawn, or even unapproachable. Add to that the unconventional, freedom-loving, rebellious 5, and you have a chameleon with a mind that might go anywhere, bouncing with unconventional ideas. You are likely individualistic, and dislike feeling pressured to conform. Nor do you appreciate being taken advantage of. This combination of numbers is particularly promising when viewed, rather than viewing the influence of each number individually. Your challenge is to let each part shine through and play off one another. Finding a balance between the creative 3; the intelligent, analytical 7; and the original, sometimes eccentric 5 (with its talent for self-promotion) creates a recipe for success. This should be particularly true in a creative, unconventional career. Your main challenge lies in becoming focused on unrealistic expectations or impractical goals. You should be realistic in your endeavors. Your personal life could be challenging due to the rebellious, freedom loving, undisciplined 5, and the periodically irresponsible and somewhat immature 3. Focus on the stable, studious 7 to help you stay focused and balanced. A word of warning: both the 3 and the 5 are sensual numbers that are easily tempted to indulge. They also have an obsessive streak with the tendency to take things to the extreme. Discipline and moderation are keys to maintaining a balance in all things. Includes your 8-page Personal Numerology Reading and Daily Forecast. Make one for your friends too! Optional Upgrade: Limited time offer - $10 off the Full Subscription. 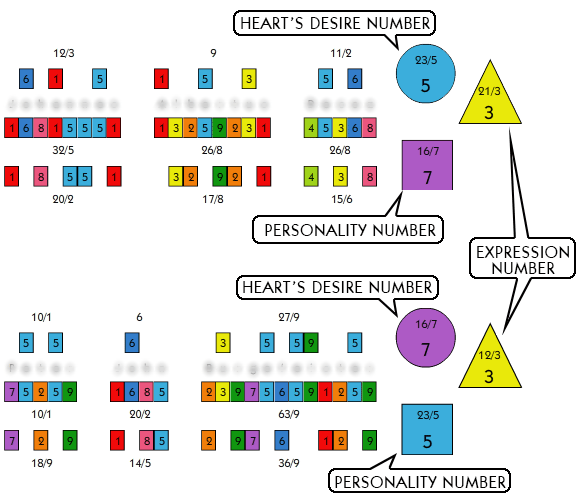 Worldnumerology.com - 2019 Copyright © Hans Decoz and World Numerology LLC. All Rights Reserved. Protected by Copyscape. Do not copy content from this page.